Jardín™ is committed to equipping young children with Spanish language and critical thinking skills, a global mindset, and teaching children to embrace healthy habits and a sense of caring for the environment.  Jardín Spanish Immersion Academy™ provides high quality early education in a Spanish language immersion environment where healthy habits and environmental care practices are promoted, and diversity is embraced. Early academic achievement remains a top priority at Jardín™ as we prepare the youngest scholars for Kindergarten readiness and beyond! Our proprietary Multicultural Spanish Immersion Curriculum is designed to promote the comprehension and use of Spanish from an early age. All children receive a complete developmental screening within 3 months of entering the program. ​ Our bilingual teachers foster an ideal learning environment for each age group we serve, taking care to address both academic and social-emotional skills that prepare lifelong learners. Children are exposed to a variety of concepts including literacy, pre-writing, early math & science concepts, and are encouraged to develop creativity and character through play-based learning. Enrichment activities including field trips, dance, music, art, and more reinforcing just how fun learning can be. With beginning math and reading built into each day, we are proud to say that our graduates typically score in top levels of Kindergarten entrance tests! Next to our wonderful enrolled families, we recognize that our teachers are our greatest asset! Our teachers believe in our mission of early education in Spanish, cultural learning, and care for our environment! We are proud that our employees truly enjoy children and have careers that reflect their passion. Each day, your child receives the love and hugs they need to feel whole, welcome, and embraced at school, helping them to build trusting relationships. The majority of our teachers are native Spanish speakers, and all work as a team to help instill a love for their language and culture in the children they care for. Learn more about what we look for in our teachers and what we give back to them to show our appreciation for their daily efforts, the love they share, and the education they give. Our meals are prepared on-site in our commercial kitchens, this allows us to ensure that the food is freshly prepared, natural, and organic! Our range of well-balanced meals provides a varied diet and encourage children to look beyond chicken nuggets and corndogs – your children will enjoy quinoa, avocado, beets, and more! Our everyday efforts in providing natural and green care for your children include providing cloth diapers for infants and toddlers while in our care, this practice is estimated to keep over 94.000 disposable diapers out of landfills each year! We also vote against pesticides by serving organic food. Our curriculum is geared towards green thinking whether we are teaching through art and play about the importance of recycling and reusing, or through outdoor play and pre-school field trips where we give children hands-on experience in nature. Many of us are parents ourselves and we recognize the importance of taking care of our beautiful planet, as someday it will belong to our children. Our standing commitment to the health and well-being of our world can be seen in our organic food, curriculum, and care choices! We encourage you to visit one of our locations to see first-hand our commitment to environment and well-being of your children. The pride we take in our work with your children is reflected through our welcoming centers. With the highest standards for cleanliness, you can rest assured knowing that our toys are disinfected daily and surfaces are cleaned throughout the day. The walls are brightly painted and decorated with friendly designs. Windows let in plenty of natural light and playful music lets you know that Jardín™ is a positive place for children and families. Come see our warm and welcoming centers. Xavier grew up in México City, learning his strong work ethic and dedication to family from his parents. Xavier’s inspiration and persistence, as well as his drive to achieve the creation of something completely unique, make Jardín™ what it is today. Xavier is a leader by example, spending time in the Centers to show our teachers what makes Jardín™ different, and ensuring that each child in our program receives the best we have to offer. His work as an entrepreneur in his community has been recognized as an example of the type of positive leadership that our Twin Cities community needs. In 2001 his first child, Kylie was born. As a working parent, Xavier could not find a daycare that aligned with the values he held for his family. After seeking referrals and suggestions from friends, family, and neighbors, not one daycare in his community could provide what he believed to be necessities for his precious daughter. Believing that his child, and many other children, deserved simply the best start possible, Xavier co-founded a unique child care center that prioritized early academic achievement, bilingual education, cultural competency and diversity, organic eating, environmental stewardship, and clean, safe, loving spaces filled with teachers who care. 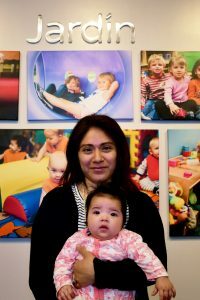 Since then, Xavier’s family has grown to include his son Colten, and Jardín™ has grown to include Centers throughout the Twin Cities. Xavier excels at executive and program level management, providing responsive customer service to our families, giving staff trainings, and fostering positive and fun work environment. His vision includes going above and beyond to offer staff excellent employment benefits, access to career-advancing trainings, and opportunities for professional growth and longevity in a field they love! His knowledge of DHS day care licensing regulations coupled with years of implementing best practices allows Xavier to plan strategically and lead critically to ensure that the Jardín™ Centers remain at the forefront of early learning. In his free time, Xavier enjoys spending time with his two children, being outdoors playing soccer (GO CHIVAS!! ), going to movies, and Salsa dancing. •	Bachelor’s Degree in Law from the Central University of Las Villas, Cuba. Translated and evaluated by an approved US foreign credential evaluation agency as an equivalent of a Bachelor’s Degree in Law in United States. Danisbel enhances the Jardín™ team with extensive experience in many aspects of early childhood education. She began her professional career in Cuba as a judge, mastering keen observation and discernment skills. She soon realized that those same skills when coupled with her passion for children were a perfect fit, allowing her to assess and support children at an individual level to ensure their success. In 2009 she became a licensed teacher in the state of Florida, and the following year earned her Director’s Credential with a Prekindergarten Endorsement from Florida State. Additionally, she earned her national Child Development Associate Credential in 2014. 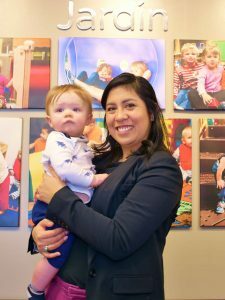 Her professional experience as an early childhood educator includes over nine years of classroom experience at the preschool level, including three years as a Spanish teacher in a Montessori setting. Once again combining her education and experience, Danisbel expanded her teaching capacity to include supporting adult learners as a Professional Development Specialist on behalf of the Council for Professional Recognition, serving as a mentor and coach for educators seeking to earn their Child Development Associate Credential. She is knowledgeable in five different early childhood curricula including the Creative Curriculum, Montessori Approach, Reggio Emilia, Theme-Based Curriculum, and High Scope. Danisbel is a goal-driven educator, passionate about discovering the motivation behind children’s behaviors, addressing their needs at each developmental level, and working with our team to support both kids and staff with strategies that ensure positive growth. Her role at Jardín™ includes leading our innovative program through the NAEYC accreditation process, the Parent Aware rating system, facilitating the program’s participation in Child Care Assistance Programs, and enhancing our unique Spanish immersion early education curriculum to provide individualized teaching to children along professional development support to teachers. Danisbel has deep understanding of the meaning and purpose guiding her career, based on three main principles: 1) Commitment to professional ethic, standards of practice and the care and education of young children as an educator who wants all children to be successful learners 2) Solid commitment to support teachers in their professional growth 3) Fostering understanding of cultural diversity. In her free time, Danisbel enjoys spending time with her family, reading, traveling, and expanding her professional knowledge. Rebecca Maki joins our administrative team as our Controller with over 15 years of accounting experience. 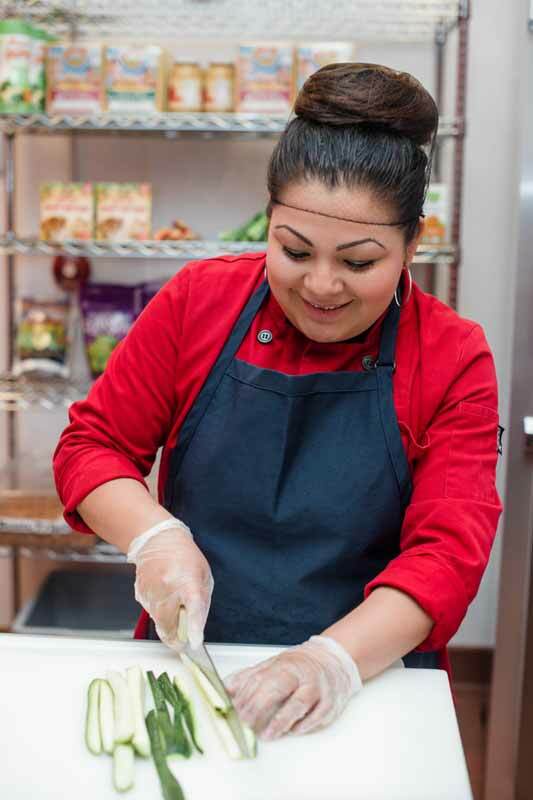 She grew up just two miles away from Jardín™’s Powderhorn location which makes her appreciation of the community that much higher. She spent her teenage years living in Annandale which is located 50 miles west of the Twin Cities, returning to the Twin Cities to begin her studies and start her career. Before starting her career, Rebecca studied accounting at Metropolitan State University in St. Paul. She enjoys her field and has previous experience including 13 years at Range Development Company, an assisted living and memory care provider and 5 years at Campus Club at the University of Minnesota, a catering and restaurant venue. Her education and previous experience allows her to enhance and maintain an organized and up to date system at Jardin. Rebecca enjoys the investigative aspect of accounting and strives to make processes more efficient. Her role supports the administration team and all the teachers at Jardin with an effective, clear and organized accounting system. 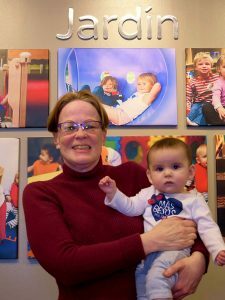 As a mother, Rebecca knows how important care and education are for children and she enjoys working with a company that emphasizes quality care and education though a unique program. She appreciates the focus on diversity and Jardín™’s language-based multicultural curriculum. During her free time Rebecca enjoys walking, biking, swimming and preparing and/or trying new foods! Derewko joins our administrative team as Office Administrator. 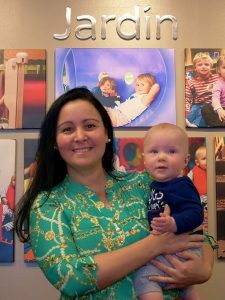 She is thrilled to be working for Jardin because it aligns with her belief that every child deserves a bilingual and multicultural education. Derewko, was born and raised in Brooklyn, New York daughter to parents that had just immigrated from Mexico. She was raised bilingual and feels that her life is enriched because she speaks two languages. Growing up in New York City she was surrounded her whole life by diversity and she has a sense of fulfillment and joy growing up in the melting pot that is New York. She graduated from Hunter College majoring in Communications and Media Studies. She has always had a passion for teaching and most recently she worked as a substitute teacher for public schools in Brooklyn. She also worked as an assistant communications coordinator for a non-profit. She moved to the Twin Cities to raise a family and to expand her work experiences. She believes that working for Jardin will combine her two passions, early childhood education, and administration. Previously, she has worked in media publications, broadcasting, and marketing. She feels lucky to have worked in different fields and is always eager to learn. In leisure, she likes to enjoy nature by going camping, reading a good book, meditating and practicing yoga. She is also very excited to explore everything Minnesota has to offer. •	BS in Psychology from Loyola University, New Orleans. Frances joins our administrative team at Jardín as the Enrollment Specialist. She is looking forward to helping prospective families become part of the Jardín family. As well as promoting the value of bicultural and bilingual learning in the surrounding communities. Frances, born and raised in Mexico City, has spoken English and Spanish all her life. Raised in a multicultural household, she understands the beauty and power of knowing more than one language and believes in giving all students the chance to become bilingual. She moved from Mexico to go to college in New Orleans where she received her BS in psychology in from Loyola University. Most recently, she taught in a first grade classroom. She wants to put her passion for encouraging students to achieve their greatest potential to work helping Jardin and its students grow and expand. Frances is excited to be joining a team dedicated to using the power of language to explore culture. Frances started her career in education by becoming a teacher’s assistant in a fourth grade classroom at a public school in Washington, DC, working for an educational non-profit organization, City Year. It is here she found her passion for working with students. From Washington, Frances moved to Oceanside, California. She worked for four years at High Tech Elementary/North County, a charter school using project-based learning. Her experience in the After School Program, as a liaison with the PTA, and as an Apprentice Teacher in the third and first grade classroom reinforced her belief that education goes far beyond books and that classroom culture impacts the lives of all students. She understands the importance of creating a classroom where students feel safe to learn and grow, building a curriculum that supports all types of learners, and working together with families and the community to support students’ understanding of the world around them. Frances looks forward to putting her experience to work supporting the Jardin team. In her free time, Frances enjoys spending time outside either walking, running, or biking. She also enjoys spending quality time with her family and friends and learning more about the Twin Cities. Copyright © 2019 Jardín Spanish Immersion Academy™. All Rights Reserved. Education Website Design.